We need video and recording equipment for our exciting upcoming meeting on September 28th when we will have distinguished speakers sharing the Veterans Freedom Center effort that was built in their community and what we might consider for our community. The intent on recording this session is that we create a communications tool that can be reused often with partners and donors. Please connect Kent or Dwight to anyone who can help. The donations we made to The Andrew Green Foundation were well used and effective. Dave McKee shared that the Haiti High School receiving those funds achieved 28 out of 29 students passing the mandatory exam compared to a much lower average normally. The connection to our friends in The Prodigals from Irish Festival days with Andrew’s brother, has been a meaningful opportunity for us to support this school and in Andrew’s honor. Our most heartfelt condolences go out to Claudia and Tom Trusty with the passing of Claudia’s sister, Elena. We have signed and sent a card from our group and ask to keep them in our thoughts and prayers. Wolf has requested more volunteers to judge the robotics competition Sunday September 30th in Worthington. Please reach out to Wolf if you can help judge the competition. Dr. Todd Hoadley, one of our very own members led the discussion about the November 6th Ballot information and Issue 5. Page introduced Dr. Hoadley, Superintendent of Dublin City Schools, Kristy Venne Director of the Emerald Campus and Brian Kern, Financial Officer. The Emerald Campus purchase and renovations cost less than 25% of the cost of building a new school building. It was purchased to prevent overcrowding. Tours of the school were taken at meeting conclusion by student ambassadors. 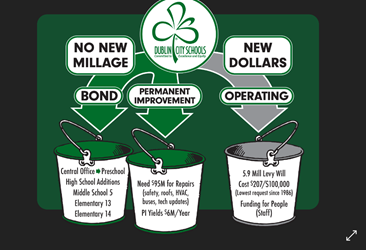 A graphic was reviewed that explains the No New Millage portion of the ballot issue and what rolls in and out of the tax impact. With certain bonds rolling off, there is no additional impact for portions as illustrated. After Brian Kern and Dr. Hoadley reviewed the information for the bond issue, 2 parent volunteers from the Good Schools Committee shared their experiences and the work communicated by the committee. fordublinschoools.org is another site you can visit for more information.